Zalto is based in Neunagelberg, in Lower Austria, in the most northeasternmost part of the country. The Zalto family, a glassmaking dynasty, came here from Venice over six generations ago. Over the last few years, Zalto stemware has become more and more popular among consumers and producers in Germany, including on the Mosel. In the Nahe region, Tim Fröhlich of Schäfer-Fröhlich is a big fan of Zalto and uses different-sized glasses for his various wines. Several years ago, I first drank from a Zalto Denk'Art glass for white wine and was struck by how light and balanced it felt in my hand and how it accentuated the taste of the Nahe Rieslings that I was sampling with Matthias Adams of von Racknitz. Since then, I decided to buy a couple of the Universal as my everyday, all-around glass for both white and red wines, though I mostly drink Mosel Riesling. The smaller white wine glass from Zalto is another very good option for Mosels whether dry or sweet. In contrast to the Riedel Sommeliers Rheingau glass, Zalto's white wine glass is far better for swirling and is tapered inward at the top with a similar form to the Universal and the other Denk'Art models. Riedel's machine-made Vinum series Chianti Classico/Riesling Grand Cru is also a popular choice for German Riesling. Before switching to Zalto, I preferred Spiegelau Authentis, a common glass at Parisian wine bars and shops, which often put their logo engraved on the side or foot of the glass. In 2004, the German company Nachtmann, including Spiegelau, was purchased by its main rival the Austrian Georg Riedel, owner of the large Riedel Glass Works. Like Spiegelau, Schott Zwiesel (Zwiesel Kristalglass AG) is another well-known German glass manufacturer based in the Bavarian Forest and close to the Czech Republic. Yet Zalto is, in my opinion, finer and better looking than the others. In the Czech Republic, the region of Bohemia, where the Riedel family originates, is famous for its Bohemian glass and artisans over many centuries. Zalto has glassblowers from here, too. With the Denk'Art series, Zalto pays homage to the Austrian wine expert Hans Denk, who was a mentor for the development of this line of stemware. "They are produced without the addition of lead oxide and are resistant against clouding," Zalto says. Despite the paper-thin glass, the delicate-looking Zaltos are quite sturdy. Zalto even recommends washing the glasses in a dishwasher. As I don't have one, I just wash the glasses under running hot water in the sink. Zaltos are mouth blown in one piece, so that they don't easily break, as some glasses do at the top of the stem, where it meets the bowl. If you're not careful, breakage often occurs at this joint when polishing certain wine glasses by hand. Image courtesy of Christoph Hinterleitner. The Schott Zwiesel Taste red wine glass is quite good for the price. 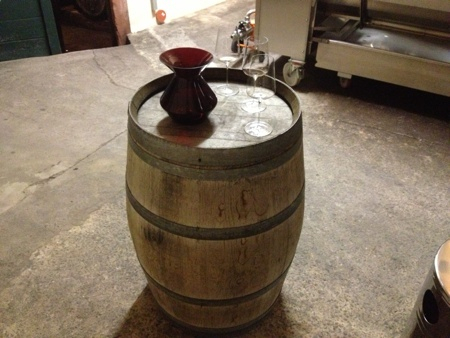 A friend uses these for both red and white wines, especially Mosel Rieslings—a glass that I would like to buy, too. I only have three Zalto Universals now. 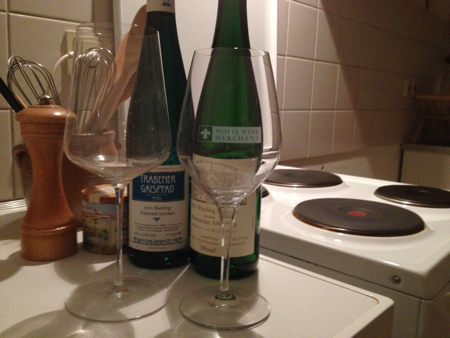 In addition, Stölzle Lausitz also makes the INAO-style tasting glasses for its Grandezza and Classic long-life series. On a recent visit to Weingut O. in Traben-Trarbach, I learned from Olaf Schneider that the Gabriel-Glas comes in both hand-blown and machine-made versions. He had the latter at his home in Rißbach. Gabriel is supposedly making a lot of money with his name. Today, I ordered a couple of the machine-made Gabriel-Glas. I’ll probably buy six more later this summer, and I’ve 12 Schott Zwiesel Taste white wine glasses for a large tasting or party.